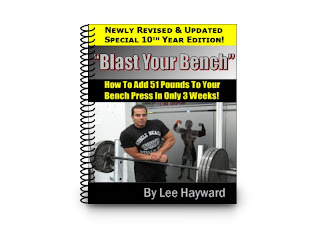 Lee Hayward's Total Fitness Bodybuilding Blog: Get A FREE Copy Of "Blast Your Bench"
I've just put the finishing touches on the brand new 10th Year Anniversary Edition of my "Blast Your Bench" program. No doubt if you have followed along with my stuff you've heard about this awesome bench press specialization program that can literally help you pack on 50+ pounds on your bench in just a few weeks. 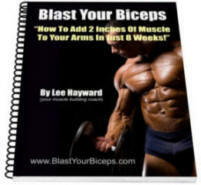 Well, tonight on our live Total Fitness Bodybuilding Talk Show I'm going to tell you how you can get a copy of this program for FREE! This 10th Year Anniversary Edition isn't even available online yet. But I'm going to show you how you can get an early bird freebie copy for before anyone else! 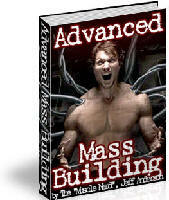 In addition to that I'm having my good friend and fellow online fitness trainer Vince DelMonte joining me on the show. This is going to be a really cool show because I was chatting with Vince earlier today and he shared some crazy fat loss strategies that he used to get in his most ripped shape ever. There's one fat shredding technique in particular that just blew my mind when I heard about it. In fact most people would think you'd have to be absolutely insane to even try it, but Vince has found that you can literally lose a pound of bodyfat per day with this radical fat loss trick! Of course you'll also be able to get your questions answered live on the show as well. But we are doing things a little differently tonight because we are anticipating a large number of viewers. All you have to do is submit your questions right in the form and they will be answered on a first come, first answered basis. You don't want to miss out on this one. 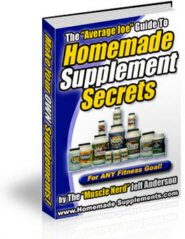 You may recall yesterday I mentioned about Vince's "Mega Fitness Program Package" where he is giving away all his best muscle building and six pack abs programs when you grab a copy of his killer 9 Disc DVD Series.